New Derby County head coach Darren Wassall insists he was not appointed because of a close friendship with chairman and owner Mel Morris. Wassall, 47, has the job until at least the end of the season following the surprise sacking of Paul Clement. 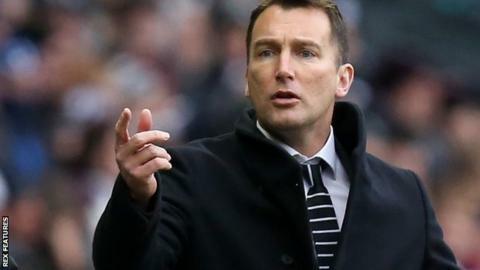 "I do know him but it would be an insult to him and me if anybody thought he gave me the job because I was his friend," Wassall told BBC Radio Derby. "I know for a fact that sentiment hasn't come in to this decision." Wassall succeeded Clement on 8 February after a seven-game winless run. The Rams were still in the play-off places at the time, and remain there despite losing to MK Dons in Wassall's first match in charge on Saturday. Wassall said he "got on well" with owner Morris but on a "professional basis". "We've been out for dinner for a curry about two times in 20 years, so if that's great friends then I haven't got many," he added. "I have been here seven years, the chairman bought the club in the summer so I am hoping - and am convinced - that the work I have done here has given me this opportunity."